Its beauty lies not in the enunciation or composition, but in the core meaning of the word itself. Derived from the “Sandhi” (or joining) of two individual Sanskrit words ‘Namah’ and ‘te’, Namaste literally means “I bow to you”. Breaking it up further, Na meaning ‘not’ and Mah meaning ‘mine’ come together as ‘Not mine.’ This in essence has to do with the acknowledgement of the fact that there is no ‘I’ or ‘Me’, but only eternal spirit. The actual meaning of the word (relatively unknown to the west), has to do with the divinity encased in a human form acknowledging another. It is often associated with a hand gesture wherein hands joined together with fingers pointing upwards are held close to the chest (heart chakra-the seat of human emotion) while the head is bowed slightly in reverence. The wordless gesture in itself means ‘namaste’ and does not necessarily have to be accompanied by the word. Either as a ‘Mantra’ (word) or ‘Mudra’ (gesture) or combined, it expresses the same thing-one of the highest forms of respect for the divinity contained and expressed in another human being. There can be a number of other interpretations for Namaste-all of which are correct. In essence, it is symbolic of ONENESS. So it can be taken to mean the removal of all the duality that we see in creation-good, bad, right, wrong, light, dark, truth, falsehood, birth, death-everything. In many ways it represents the absence of “two” in the mighty Mayic cycle of creation and the presence of only “one” in absolute spirit. One aspect of such duality in particular is that of husband and wife complementing each other’s existence while they work together as one unit to reach the ultimate goal of self-realization. Marriage is supposed to be one of the holiest of institutions meant for combined spiritual progress between two entities possessing the male and female aspects of God. 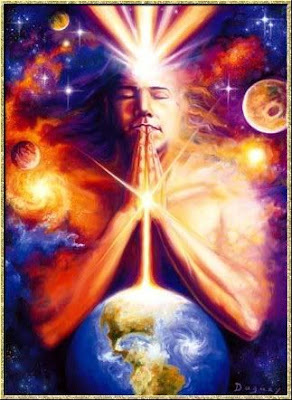 This “Oneness” may be another representation of Namaste. The gesture itself holds significant meaning, if one considers the five fingers of one hand to correspond to the five physical senses which drive the karmic cycle, while the other five signify the five organs of knowledge of the human SELF. Then Namaste would essentially mean, knowledge and karma coming together as One, which would mean the performance of action guided by right knowledge. A synonym for Namaste is ‘Namaskar’ or ‘Namaskaram’-all of them always taken seriously when uttered with complete and absolute respect-even when spoken to a stranger. The gesture has become so idealized by the average Indian, that even a picture of a person with bowed head and folded hands is immediately attributed to India. Inevitably. Universally. And very much to my delight and pride. In my work as a business correspondent, I come across different people from various countries and I revel in talking to them and gaining a better insight into the industry that I cover. However, when I speak to my Indian business contacts/friends (no matter where they are located in the world), I somehow always begin my sentences with an enthusiastic ‘Namaste’. And I immediately find myself smiling in spite of myself. The person at the other end of the line (or face to face), always responds with a Namaste-even if he/she is not a particularly amicable mood. And more often than not, the Namaste breaks the ice and enables a longer and friendlier conversation than I would expect to have, had I begun with a simple “Hello”. The fact that I am a fellow Indian shows itself clear as day with that first Namaste and it creates a kind of common ground for further talks/chats and general give and take of information. I once called a contact in Shanghai, who held a very senior position in an Indian iron ore mining company in Goa. When I spoke to him for the first time, after the regular Namaste, Kaise hai aap? (How are you?) The conversation went smoothly, and every call I made to him after that, the interaction between us became smoother and friendlier. When I was in Shanghai with my editor for a conference, we met up with the abovementioned friend from the mining company, who quickly got chatting with my editor. After a long hearty chat about Goan iron ore export prices to China, my editor concluded by thanking him for taking the time to talk to me whenever I called him. To my pleasant surprise, he turned to my editor and said, “Shreyasi always greets me with a warm Namaste whenever she calls me. As a fellow Indian, how can I refuse to help her?” Suffice it to say that my boss was satisfied that I was making good contacts as a warm loving human being, while I was upbeat the entire day owing to the one statement made by a business contact who has now become a good friend-thanks to the one “warm Namaste”. That is what Namaste can do. It has the ability to bind, to create a sense of oneness and to invoke respect, humility and warmth in people (even apparent strangers) and the supreme divinity of the ONE intangible, yet ever present SPIRIT. That is why it was a part of ancient Indian culture and that is why it continues to be used by Indians today. Its timelessness is its virtue and in its simplicity lies its significance. That is the power of Namaste, the magic of India and the completeness of Spirit. Amazing piece of writing & I am deeply touched....Now on even I will Follow "Namaste" in my daily interaction.... Thanks for realising the Unforgotten, but simply forgotten Indian culture.